You are here: Home > Nokia Lumia 2520 tablet on its way to T-Mobile? 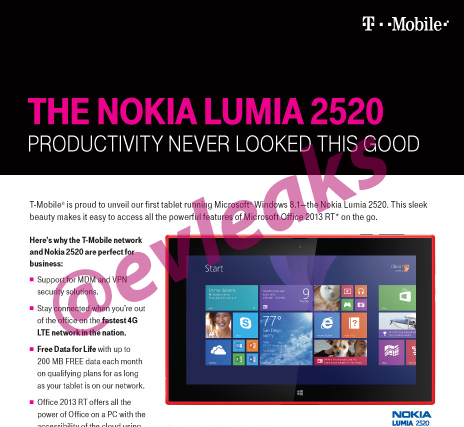 Nokia Lumia 2520 tablet on its way to T-Mobile? Nokia’s Lumia 2520 tablet caused a ripple of excitement back when it was launched last December. It was Nokia’s first attempt at a Windows-based tablet, and it looked really cool. Its full HD, 10.1-inch, 16:9 ratio IPS display acts as the portal through which you enter the world of Windows RT. What’s more, it’s equipped with category 4 LTE, giving it a theoretical top download speed of 150Mbps. It also has a 6.7MP rear camera with Carl Zeiss optics, a quad-core 2.2 GHz Snapdragon 800 processor and a non-removable 8120mAh battery. And, if a recent leak from @evleaks is anything to go by, this 4G Windows tablet could be set to finally launch on T-Mobile. There’s no further information in the leak. No pricing is mentioned, and neither is any specific release date. Once here, it’ll be the first time T-Mobile has carried a Windows tablet, and perhaps shows a little more commitment to Microsoft than we’re used to. If we hear anything extra from our sources (price/release date/stock in store images) we’ll let you know. Who’s excited? Will you be grabbing the Lumia tablet on EIP when it’s here? ← Happy 4th of July, TmoNews readers! Tmobile needs it’s own Lumia 1520 variant…then we have a story! Tell me about it. The display on that thing is pretty incredible. Amen to that. I really like that T-Mo is apparently getting the 2520, but I do feel bitter about the fact that Verizon and ATT got it first, months ago. Still annoyed that ATT ended up getting the 925 when it was supposed to be OUR exclusive in the US. But yeah, I totally agree about the US exclusives. You do realize that the Lumia 520/521 was one of T-Mobile and AT&T’s top selling phones, right? At one point it was T-Mobile’s top selling phone, period. Sure was. Before they launched the iPhone. You’re kidding, right? T-Mo was selling the iPhone a long time before the 521 was released. Lumia 520 is probably the single reason why AT&Ts 3rd best selling smart phone brand is nokia. Yet Windows Phone still has a roughly 4% worldwide market share. U.S.or worldwide market share is irrelevant to my reply. UMA_Fan made the claim that Windows devices just don’t sell. This is an untrue statement, especially considering how well the 520/521 have done. 80 million+ Windows Phone users, while the minority of smart phone users, certainly doesn’t constitute not selling. I would beg to differ. What you consider “well” for a WP device would be very weak numbers for an Android device. “Well” is a very relative term. I’m not saying you’re wrong. I’m just saying I disagree. Keyword there is “decent”. There aren’t any decent Android devices at those price points. Closest is the Moto X. They sell quite nicely. It’s the store reps I’ve mostly seen discouraging customers from buying them and try to sell them Android or IOS instead, a practice that needs to stop. Word of mouth on windows phone isn’t great. The ONLY potential market for windows is that tiny pool of people who have yet to purchase a current gen smartphone and blackberry users. Even if windows phone was shoved down peoples throats return rates would be high as they are now. I liked windows but its a lost cause at this point. Its never going to overtake android let alone iOS. Tiny pool? Are you seriously calling the billions of non-smartphone users a tiny pool? Last time I looked, billions wasn’t a tiny number. Look. Windows Phone is a DISTANT third, but don’t try and sell it short using hyperbole. Let’s at least use facts at least. As a store rep, I genuinely gave WP my honest try. Ran with an unlocked 1520 for 7 months, couldn’t stand the lack of app support. Great device, but its in the same boat as Blackberry now. Oh wait…it’s 10.1″ and it only runs Windows RT….nevermind! Finally! I’ve been waiting for a Windows tablet for a while. I just wish it was Pro instead of RT, but you take what you can get. Why pro? RT can do a lot more multitasking! What makes you thing that, considering a Pro tablet runs the full Windows OS? You are incorrect. Snap works on Windows 8.1. Also Windows 8, Windows 7 and WIndows Vista (where the feature originated). Plus you could always just open two windows on Windows XP, 2000, 98, 95 and even 3.1. Really? Because I’ve got this split with Twitter on the side on my T100 running 8.1. You only can’t snap on 8.1 without a touch screen iirc. It doesn’t matter what type of interface you use, snapping multiple apps side by side is an inherent feature of Windows 8.x. You could also snap two windows to either side of the screen on Windows 7 and Vista before that. I’m waiting for an Android tablet(preferably a Nexus) with band 12 on board – but having windows as an option is always nice for customers who need options. I’m predicting that T-Mobile will price this way too high. If they offered this with the power cover/keyboard for $400-450, I think you’d have some takers. I was under the impression Windows Tablets tend to be really cheap even when compared with Android. Hard to compare in many cases. If you look at Dell Venue vs Venue Pro, the Android version is cheaper, but omits stylus support and is only dual core. So, maybe about the same? Well they have different styles when it comes to the operating system. Android is about power and specs and freedom to do whatever you choose to, Windows 8 is similar to iOS in that its about providing a specific experience that is easy to use and performs well at any price range because of that specific experience, it doesn’t need the bells and whistles because thats not what you’re buying it for(or rather, shouldn’t be buying it for.) As Windows 8 Matures I become more and more partial to accepting it as an alternative to Android and iOS. It’s not quite in their range yet, but it looks to be getting there more and more each day. I’m sure getting this tablet, and the screen is pretty nice. Trying to decide on wether to get windows 2520 tablet or the galaxy note tablet 2014 edition. Both are great tablets. I’ll get it if it works with Xbox! @evleaks is now saying that a 1525 is on its way to T-Mobile. This is pretty unbelievable (at least to WP people on T-Mobile)! Have iPad mini with retina display ? 128mb of int storage. Saying that I want the windows tablet, the ability to do real work, the ability to use a mouse with it and the list goes on. Going to pick up a keyboard accessory and use it as my home laptop. Thank You T-Mobile. I’ll get it right out of the gate if it works on the new 700 band for T-Mob. Otherwise, I will wait.